Delight in the journey of chocolate discovery with Godiva's New Gold Discovery Collection, a tantalising assortment that showcases the best of our chocolate expertise and craftmanship, following on from our Belgium tradition since 1926. 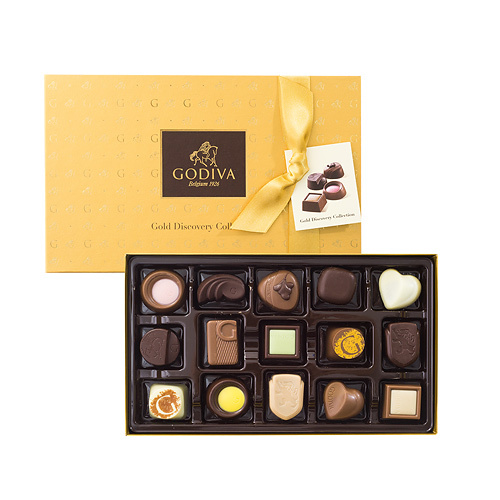 Whether you're looking for a special gift or a well deserved self treat, the Gold Discovery box is sure to delight. Ingredients: Sugar, cocoa mass, full cream milk powder, cocoa butter, hazelnuts, vegetable oil (palm, palm kernel, shea nut), humectants (sobitol syrup, glycerol), butter, glucose syrup, cream, vegetable fat (palm kernel, palm), skimmed milk powder, macadamia nuts, full cream milk, butter oil, emulsifier (soy lecithin), maltodextrin, strawberries, flavourings, wheat flour, lychee, invert sugar syrup, inulin, fat reduced cocoa powder, salt, beetroot concentrated juice, natural vanilla, honey, colour (E102*, E171, E129*). *May have an adverse effect on the activity and attention of children. Allergy Advice: Contains nuts, milk, soy and gluten. May contain other nuts.